It has been clear for more than a decade that LED curing for flexographic printing should be a very good fit due to the many benefits it provides. While the adoption rate has slowly accelerated recently, overall it remains to be a niche solution due to high cost and limitations of the equipment and inks. The transition to LED may well be at a tipping point to becoming the preferred solution for flexo printers and brand managers due to the latest generation of LED technology. This technology fits equally well for retrofitting the thousands of existing UV and waterbase flexo presses as well as to new presses. Why the interest in LED? Complete research papers have been written on the benefits of LED for flexo printing so the reason for this blog is to briefly summarize the key points of conventional LED flexo curing systems to UV Arc and waterbase printing. From a performance standpoint, the conventional flexo LED technology generates a significant amount of heat (as much as 297 degrees F). This has several significant disadvantages. In order to run heat sensitive substrates (such as shrink films or other thin gauge films), chill systems are mandatory for the press. Shrink film begins to shrink at 140 degrees and will break at 248 degrees. Chiller systems are both costly and require the use of a coolant. This can generate condensation at the lights which could potentially get onto the print, and, if a leak occurs, significant time and money are required for clean-up. Heat also is the single most significant component affecting the length of life of LED lamps. The more heat, the shorter the lifetime of the lights. Lastly, web breaks on heat sensitive films happen quickly if any issue with the chill system occurs. 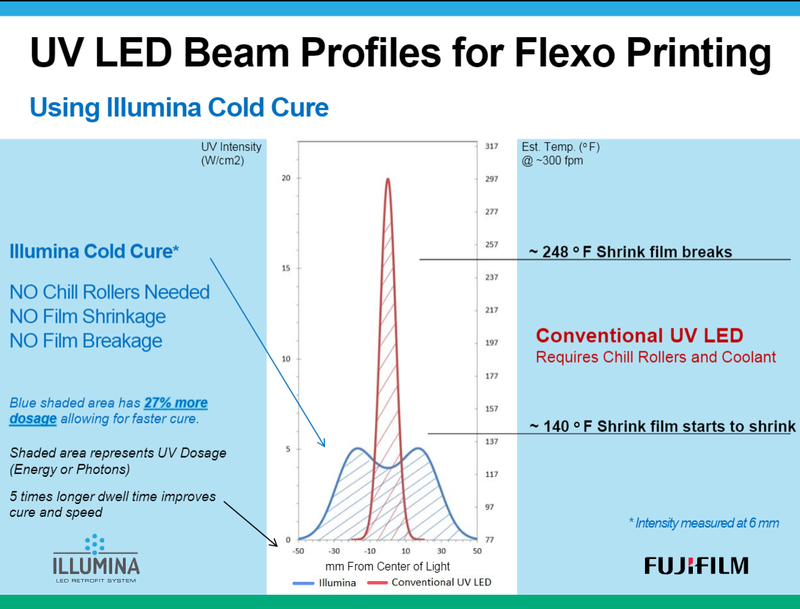 What is the next generation of LED for flexo? Fujifilm has recently brought to market an innovative new combination LED equipment and ink solution that provide all of the benefits of conventional LED while addressing the shortfalls and doing it at a very attractive return on investment. Illumina COLDCURE is based on a unique patented LED system that provides even further reductions in power, virtually eliminates heat from the equation and provides higher dosage for faster curing. The hardware development was done in conjunction with our ink Chemists to develop the 300 Series (flexo) and 350 Series (Rotary Screen) UV/LED hybrid inks that are optimized to the Illumina system. Together they provide very high performance at the same price point of conventional UV inks. These hybrid inks can also be ran on conventional LED systems or even UV Arc so one ink system can be used for all UV Arc, Conventional LED or Illumina COLDCURE LED. The differentiated LED lights and construction of the system both generate less heat (135 degrees compared to 297 degrees for conventional LED) and also produce 27% more effective dosage to cure the ink. Recall from earlier that shrink film does not begin to shrink until 140 degrees F. This means Illumina runs even high % shrink films with no need for chill drum rollers. This allows a printer to enter the shrink market with their existing press without investing in chill drums or to eliminate the cost and maintenance of chill drums on a new press. Several other benefits of the extreme reduction in heat are summarized below. The dosage gain is achieved by the unique lamp design and construction that create a much longer dwell time from the center of the light source than conventional LED. A “double peak irradiance” is a unique characteristic of this system. At 300 feet per minute the dwell time (amount of time photons are interacting with the photoinitiators in the ink) is 5 time longer than conventional LED. The chart below summarizes the heat and dosage components comparisons into one chart. One particular flexo printer has recently retrofited Illumina and 300 Series inks on all three of their existing presses and also had it installed on a brand new flexo press. While they report many benefits of the system and ink, one of the most telling is they are now investigating converting the entire plant to Solar Power due to the 92% energy savings they have realized. We have also seen multiple cases of rebates or refunds from local power providers as the transition to LED meets the requirements for many energy saving programs. This case, and many others, demonstrate the realities of the significant breakthrough technologies . 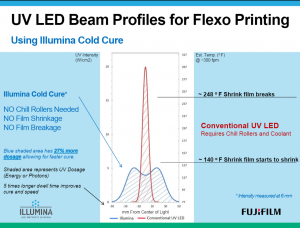 As a result Fujifilm is seeing a significant increase in the adoption rate of LED curing for Narrow Web printing. We should also note these innovations are significant enough that Fujifilm have been recognized as one of the four finalists for the Global Label Award for Innovation this year. This award will be announced the first night of Labelexpo Americas, September 25, 2018, in Chicago. To see the Illumina system first hand, swing by our Labelexpo booth #5621 or click here and schedule to see a live demonstration on our flexographic press or click here to see our Illumina video.